SAINT JOHN, N.B. - Sentencing arguments will begin in February for a member of one of New Brunswick's most prominent families. 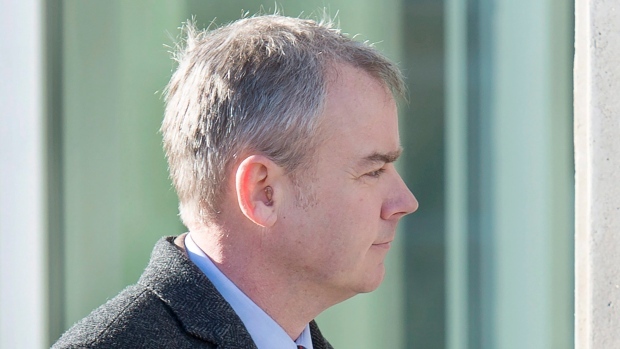 Dennis Oland sobbed uncontrollably yesterday after a jury found him guilty of second degree murder in the death of his father Richard Oland. A second degree murder conviction carries an automatic life sentence but parole eligibility varies between 10 and 25 years. Justice John Walsh will set the eligibility after hearing arguments from the prosecution and the defence. Oland's family is standing behind him -- his mother Connie issued a statement saying the family's faith in his innocence has not wavered in the face of the conviction. She says the family will discuss the options with Oland's legal team. The Oland family is best known for founding Moosehead Breweries, though Dennis Oland worked as a financial advisor. Richard Oland's body was found in his Saint John office in 2011. He'd been beaten to death.